Growing up, Ravi Corea passed up electric train sets, remote racing cars and even an air rifle — for visits to the zoo, and books and movies about animals. It was an early indication of his passion for wildlife, and in particular, conserving and protecting wild animals and helping people understand their nature and habitats. At the age of 13, he became a member of the Young Zoologists’ Association of Sri Lanka and also involved himself in organisations such as Wildlife & Nature Protection Society of Sri Lanka and the World Wildlife Fund. 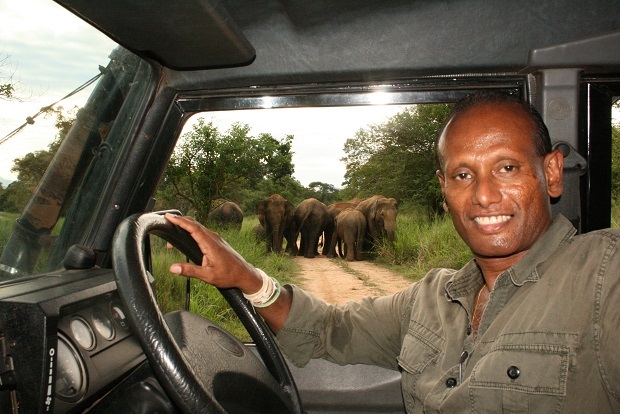 In 1995, he founded the Sri Lanka Wildlife Conservation Society (SLWCS), and today remains its president. In addition, he and the SLWCS are a pioneer and leader in human-elephant conflict (HEC) initiatives in Sri Lanka. Working outfield has not been without its challenges — dealing with politicians and bureaucrats, he points out, is perhaps what he enjoys least in his role. There is also extreme physical danger, though this in no way fazes Corea, who professes the wilderness is his Juliet. One of his most memorable experiences was sneaking up to what he thought was an injured elephant only to have the healthy creature charge at him and a mate; the pachyderm eventually settled for his shoe, which he had dropped whilst making a run for his life. Corea worked with Quotient TravelPlanner in late 2013 to design an itinerary revolving around wildlife conservation in the heart of the Wasgamuwa National Park. Participants in the seven-day experience can look forward to immersing in Sri Lanka’s great outdoors, learn about conservation measures and perform tasks associated with elephant well-being, as well as understand more about the local village and culture. In this email interview, Corea shares his passion for creatures in the wild, devotion to helping communities co-exist with wildlife and recommendation for an off-the-beaten-track experience in Sri Lanka. Quotient: Why and how did you and the SLWCS gear yourselves to focus on the human-elephant conflict? Corea: The focus on elephants happened when I was studying for my degree in Conservation Biology at the Columbia University in New York. I had to select a project to do my summer internship and for a while already I had been aware of human-elephant conflicts in Sri Lanka and that it had become a huge problem. So I selected to do my summer internship conducting a survey on human-elephant conflicts (HEC) to learn more about it and to find measures to address it. I had formed the SLWCS around the same time I entered Columbia University. When I presented my HEC study to the university, an organisation that supported the university got interested to support some of the measures I had developed. So naturally SLWCS was involved in that effort and ever since then on mitigating HEC. When I’m in our field house in Wasgamuwa the day starts at 4am even though I might not get off my bed until 5am. Around 4am the birds begin to chirp, tweet and sing. The vibrancy and energy of bird song is like an inspiring call to wake up, grab your day and make the most of it. And then the village roosters begin. To rise every day to such a natural symphony of animal calls and sounds in a salubrious environment is a privilege. At 5am the rising sun hidden below the horizon barely illuminates the surrounding hills, the Knuckles Mountains and the lake at the bottom of the hill of the field house property. I spend at least 15 minutes seated in the open veranda looking over this opening tableau and I’m always amazed by its sublime tranquility. I turn on my laptop and check my emails and sort the messages for responding later in the day. Rising early I have the entire social space of the field house to myself. The solitude helps me to get my thoughts together — many times solutions for unresolved issues from the previous day form in my mind — and reenergises me for a brand new day. My friend Dodam, a rescued giant squirrel, joins me for my first cup of fresh Ceylon tea, after which I head to check on the rescued wild animals in the field house. At 6am I head out to the Sunrise Rock about 10 minutes from the field house, accompanied by visitors and volunteers staying at the time then they would join me. The climb up to the rock gives a good start to the morning and the view from the top gives a good start to the entire day. The colours that light up the dawn sky never fails to amaze me. After sunrise we’ll walk down the other side of the Sunrise Rock to the fields, vast grass plains and scrub forest situated along the lake. We’ll observe nature, do bird watching and witness local traditional village activities. During the walk I’ll explain to the volunteers and visitors the tropical ecosystems, animals and the conservation challenges and issues we need to address. By 8am we are back at the field house where after morning ablutions and breakfast the field team consisting of SLWCS staff and volunteers will conduct the morning activities. They include tank monitoring, where we check irrigation reservoirs for elephant dung to find out the dispersal patterns and food intake; trail walking, which is tracking of elephant activity based on visual sightings of dung and footprints over a 12-kilometre route with undulating terrain; electric fence monitoring, where we walk 8 to 12 kilometres along the fences to check the state of the barricades; mammal surveying, which may involve setting sand traps for specie identification; and monitoring of community projects. Generally the morning activities will end around 12 noon. After lunch, I catch up with my work such as writing reports, proposals, articles, the blog, replying queries, making phone calls, etc. The volunteers and visitors also take this break to catch up with their social networking, write journals, etc. After tea we prepare to conduct our evening activities. They consist of elephant identification, in which we head to the Weheragala tank to observe and photograph elephants, filling in data sheets with information about physical traits as well as HEC observation, where we spend time in a tree hut located along an elephant corridor to observe how villagers and elephants interact and use the common space. Then it’s dinner followed by discussions about the day’s activities and observations and documentary watching. I find time again to work on society matters. Since we live in an area where elephants range some nights a call will come alerting that an elephant or elephants have entered the village. If so, we will head out to see the elephants and help the villagers to chase them from the village. Once I call it a day I will head to my room and drift off to sleep amidst the sounds of nocturnal animals. What is the biggest misconception participants of SLWCS’s wildlife adventure programmes have? Most people don’t seem to realise, to conserve wildlife resources are needed: financial, equipment, personnel, tools and communities. Most volunteers obtain their experience and leave; only a very few continue to engage with us and promote the work we do to a global audience and help to garner support for our work. If there is one thing you can change in your current roles, what would it be and why? I wish I had more time to spend in the field. I’d love to go back to the days when I conducted field studies. Working in the field is a dynamic process where you are constantly learning and observing new things which gives fuel to your mind to come up with new and innovative ideas. What is one off-the-beaten-track experience in Sri Lanka you would highly recommend for tourists? To participate in the Padayatra. The Padayatra is a two-month long annual foot pilgrimage that starts in the north of Sri Lanka in Jaffna, from where people walk all the way down to Kataragama in the south through the countryside, jungle and forests. The final leg of the walk is through the Yala National Park where elephants, leopards, sloth bear, buffalo, and sambur inhabits with numerous other wildlife. Outside of Sri Lanka, where is your favourite place in the world and why? That would be southern Africa, especially Namibia and Botswana. These are vast countries with some of the most remote and astounding landscapes in the world home to a large number of wild animals and yet have very low human populations. While in magnitude Sri Lanka is miniscule and cannot be compared to them, when I was young many rural areas of Sri Lanka were similar: remote, beautiful and scenic landscapes with plenty of wildlife and very few people. I guess I’m nostalgic for the days of my youth when remote wild places actually existed in Sri Lanka.